Bluetooth V4.2. One-Touch Bluetooth Calling. Protective Wireless Charging Case. Tzumi Sound Mates Bluetooth Earbuds With charging Case. Tzumi 5761WM Sound Mates Bluetooth Earbuds with Protective Charging Case. May be missing the user manual, if so see pictures above. Tzumi Sound Mates Wireless Headphones. They have been tested, cleaned, and inspected. They include all original manufacture's components. Bluetooth 4.2. Portable charging case. Small compact design. Bluetooth V4.2. One-Touch Bluetooth Calling. Protective Wireless Charging Case. We WILL be National Champ by 2035. Looks and functions just like new! We Have Continually Grown By Providing Quality Deals At Low Prices. We carefully inspect each used item to make sure have minimal or no scratching. You can expect a fully functional product. Quality Tested. 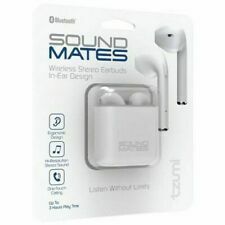 (2 Pack)Tzumi Sound Mates Bluetooth Earbuds With charging Case. Tzumi 5761WM Sound Mates Bluetooth Earbuds with Protective Charging Case. May be missing the user manual, if so see pictures above. NEW butOpen box. 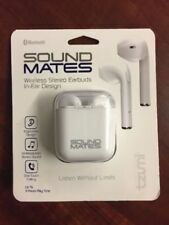 Tzumi Sound Mates Wireless Stereo Earbuds - White one month used. Condition is Used. Shipped with USPS First Class Package. Since it is Pre-Owned; may show signs of use. 100% Genuine. Bluetooth V4.2. -Protective Wireless Charging Case. All our electrical / electronic products work only on 110 Volts. Wireless and compact. Wireless Stereo Earbuds In-Ear Design. Hi-Resolution Stereo Sound. Ergonomic Design. Sorry, international expedited service is not available. You should see the option when you check out. Format: HEADPHONES, With Microphone,BLU-Spec CD,IN-EAR Headphones,Blue. Tzumi Sound Mates Bluetooth Earbuds with Protective Charging Case. Shipped with USPS First Class Package. 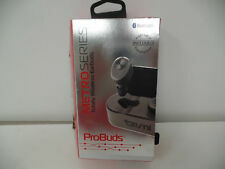 Tzumi ProBuds Driver Series 2-in-1 Micro Ear Piece. USB 2.1 Port in the charging dock for charging devices. Bluetooth Version: 4.2. 1x Charging Dock. Speaker: 4.75" x 4.75" x 1.6". Dock: 3.5" x 3.5" x 1.5". 1x Speaker. Frequency: 120 - 20KHz. 5 hours of play black. Total Harmonic Disruption (%). Sensitivity (dB). Product Weight (oz.). Headphone Style. Cord Length (in.). Color Family. Product Width (in.). Open box item! See pictures. Magnetic wireless earbuds. Does not come with extra silicone tips. Tzumi Bluetooth Stereo Foldable Wireless Headphones W/ Powerful Bass. EARBUDS ARE IN GOOD WORKING ORDER. HAS NORMAL SURFACE WEAR. We specialize in used/secondhand goods. These unisex wireless earbuds from Tzumi feature a comfortable and secure fit, incredible sound quality and connect to your devices wirelessly via Bluetooth, giving you endless possibilities for your listening pleasure. With easy-pairing Bluetooth calling capabilities, a built-in microphone and high-resolution stereo sound, tzumi SoundMates are the perfect earbuds for any lifestyle and will provide up to 3 hours of crisp, clear stereo sound. It has a built-in HD Voice Ready speaker, and up to 5 hours battery life. UNIVERSAL COMPATIBILITY: No matter what your favorite karaoke app is, this microphone works with almost all of them! PHONE HOLDER: A built-in retractable smartphone holder can hold your smartphone, to let you read the lyrics and see the app while you are singing. 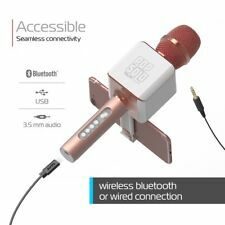 Amazon Alexa Enabled WAVE Bluetooth Wireless ROSE GOLD Headphones - SHIPS FREE! They are subtle enough to go with any outfit and occasion from the office to the gym, and won’t overpower the simplicity and elegance of your smart device’s design. These tiny buds are discreet, built with a strategic ergonomic design to fit the human ear snugly and prevent any noise from escaping, and can handle just as muchsweat or rain as you can. Tzumi Rock Solo Karaoke Mic Speaker Bluetooth Built-in Smartphone Holder. It has a built-in speaker, and up to 5 hours battery life. 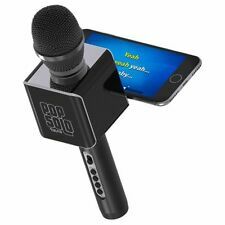 UNIVERSAL COMPATIBILITY: No matter what your favorite karaoke app is, this microphone works with almost all of them. Open box, but new !! New!Tzumi Aquaboost, Waterproof Shockproof, Bluetooth Speaker IP68 Certified. Waterproof and Shockproof, it even Floats too! I use mine at work to play my favorite songs. Powerful Bluetooth Speaker with Great Sound! Tzumi Comfort Sport Buds are specifically engineered to stay in while you work or exercise. 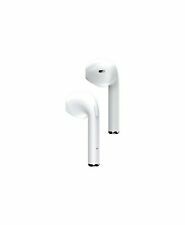 These sweat resistant and comfortable fitting earbuds provide HD quality sound with rich, powerful bass. Comfort Sport Buds.